Donald Trump speaks during a news conference presenting a model of a proposed design for the rebuilding of the World Trade Center site May 18, 2005 in New York City. 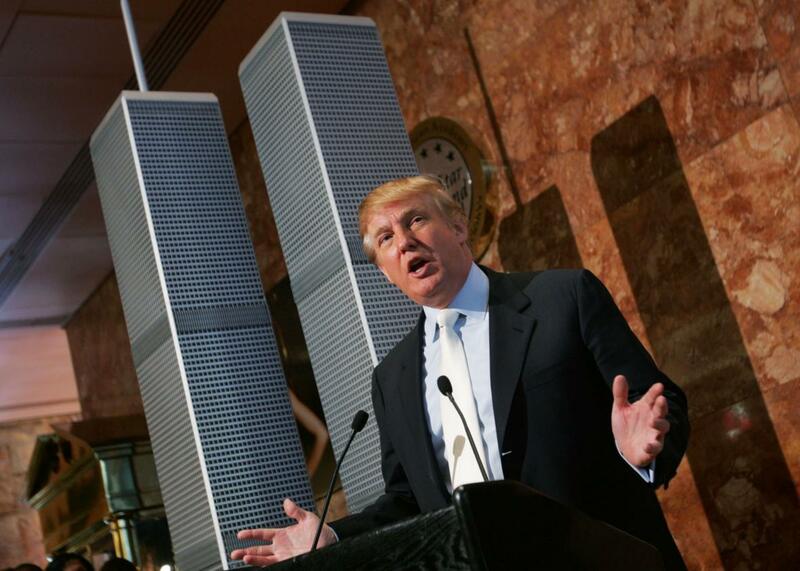 Donald Trump believes that the media owes him an apology for criticizing his claim that he saw “thousands and thousands of people” on television celebrating the destruction of the World Trade Center in Jersey City on 9/11. Trump’s tweet follows a number of right-wing blogs picking up on the same article, asserting that it contradicts the Washington Post’s Glenn Kessler’s widely-shared debunking of Trump’s claim. It does nothing of the sort. This is yet another example of Trump’s revisionist history of his own recent statements. Trump didn’t say that he had read reports of Muslims in New Jersey celebrating the attacks; he said he had seen thousands of them doing so. This seems like the sort of thing people other than him, and apparently Ben Carson, would remember seeing. (Update Nov. 23, 6:02 p.m.: Carson has clarified that he was thinking of people celebrating in the Middle East, not the United States.) Perhaps Trump’s investigators can dig up this footage as soon as they finally get back from Hawaii with proof that Obama’s birth certificate is forged. Hours after the terrorist attack on the World Trade Center, a story spread across the state: Palestinians in Paterson were celebrating in the streets. Braced for a riot, the Paterson police rushed to South Main Street, the center of the city’s Middle Eastern community. In the ensuing days, the rumor went national, lighting up talk radio phone lines. In the end, it was nothing more than rapid-fire urban myth. Howard Stern repeated the reports of celebrations in New Jersey on air, which can’t have helped in clearing things up. In the tense days following the attack, there were a number of false reports of Muslims celebrating. In one case, reported by the Asbury Park Press, a group of Pakistani gas station attendants sharing birthday cake given to them by their Jewish boss on the morning of the attacks—unaware that the attacks had taken place— set off a panic in the town that included calls to local radio stations. A similar debunked story about a Budweiser employee pulling the company’s products from a gas station because he saw Arab employees celebrating was a popular e-mail forward at the time. One strange cousin of the “celebrating Arabs” meme was the strange tale of the “dancing Israelis.” During the attack, a New Jersey homemaker with a view of the twin towers called the police and the FBI after spotting a group of men who appeared to be filming the attack and exhibiting “puzzling behavior.” “They were like happy, you know … They didn’t look shocked to me,” the unnamed witness later recalled. The men were Israeli employees of a Jersey-based moving company and accounts at the time stated they had been on the roof of their company’s building, though it was later reported they were on the roof of their van. Either way, five Israeli men were later arrested and interrogated for several days before being deported back to Israel. As ABC reported the following year, the men were investigated by U.S. authorities for connections to Israeli intelligence, but nothing was ever proven. (The lack of evidence hasn’t stopped the “dancing Israelis” from being a fixture of 9/11 conspiracy theories, particularly anti-Semitic ones, ever since.) The men later denied they had been celebrating, claiming they were just filming in order to document the event. All major terrorist attacks, including the recent one in Paris, are accompanied by a great deal of unsubstantiated rumor and false information. That was even more the case for 9/11 thanks to both its size and how relatively little public attention had been focused on the al-Qaida threat before it happened. It was a confusing couple of days and a lot of mysteries still remain, but we can be confident in saying that Trump did not personally witness thousands of Muslims celebrating in New Jersey or anywhere else in America.